This entry was posted on April 4, 2014 at 2:30 pm and is filed under Debian, Ubuntu. You can follow any responses to this entry through the RSS 2.0 feed. You can leave a response, or trackback from your own site. Will it be in Ubuntu 14.04? Yeah I just updated my 14.04 install today. Using ‘apt install foo’ is such a relief, you won’t even get it until you’ve had a chance to try it. Hi Michael, seems you missed a ; at the end of the line for the fancy progress. Anyway, this are great news, thanks! Thanks Adam, indeed I fogot the “;”. Fixed now. I hope the fancy progress bar doesn’t get enabled by default. Congrats with the 1.0 apt release! Fancy progress is the default for “apt”, but not for “apt-get”. And trivial to disable in “apt” too (by setting ‘Dpkg::Progress-Fancy “0”;’ in apt.conf). This is great! Thanks for your work in apt, it’s the best package manager. BTW, the new apt command seem like a good opportunity to integrate debdelta support to apt. Are there any plans for it? Look’s good. Compared to other distros you have to use a lot of different commands for package management in debian. Apt-get, apt-cache, apt-list, dpkg. I’d appreciate to see this all combined in one tool. This is a great beginning. What’s currently missing: commands for apt are not completed at the moment (at least for me) and ‘policy’ is missing. I’m using ‘apt-cache policy’ very often because I have testing, unstable and experimental in my sources.list (ruled by apt-pinning) and use this to get an overview which versions are available. This would be fine in most cases. Only if I configured apt-pinning for a package I’d need the policy scores to validate my settings. isn’t the command name “apt” already “taken” by Java’s Annotation Processing Tool? Correct, older java versions shipped a “apt” command as well – but thats deprecated since some versions so we can have the name. Please, add “clean” to the command list. Thanks for this suggestion! We are currently discussed a extended “clean” that will also print information about no-longer-downloadable packages and leftover configuration files (packages in the dpkg ^rc state). Also “autoremove” is an often-used command. (Nearly 2 years later) Don’t know when an all-singing, all-dancing clean might become available, but until then, how about providing autoclean and autoremove as is, or even combining them into apt clean? AIUI, upgrade is *not* “just like the regular apt-get update”, but also enables –with-new-pkgs. How to uninstall this version? 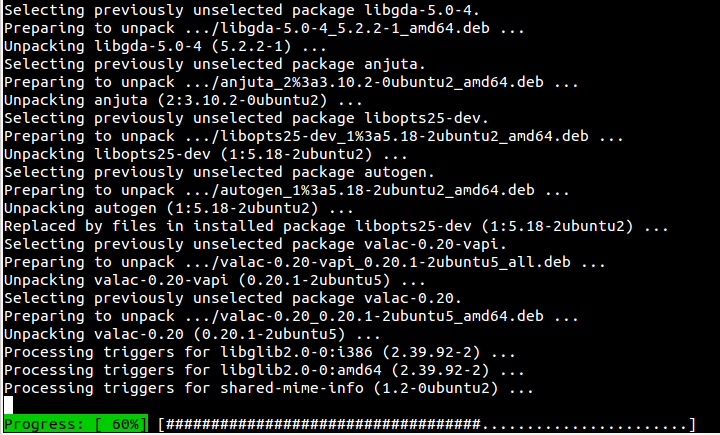 I have problem with my Ubuntu 14.04… He need libapt-pkg4.12 0.9.16 and in my system have 0.9.15. When I run sudo apt-get install -f, he want remove ubuntu-gnome-desktop, sofwarer-center, etc… How to fix this? Done! My old version is come back..
to your /etc/apt/apt.conf file – this will give you a black background. Check http://en.wikipedia.org/wiki/ANSI_escape_code#Colors for the color choices. Awesome. When shall we expect command completion for this new binary? Reblogged this on Open Fecks. package the upgrade for this package isn’t performed. As far as I know most of the code between apt and apt-get is common. Apt is more user friendly but both do the same. My question is why the developers decided to create apt. Was apt created to replace apt-get?